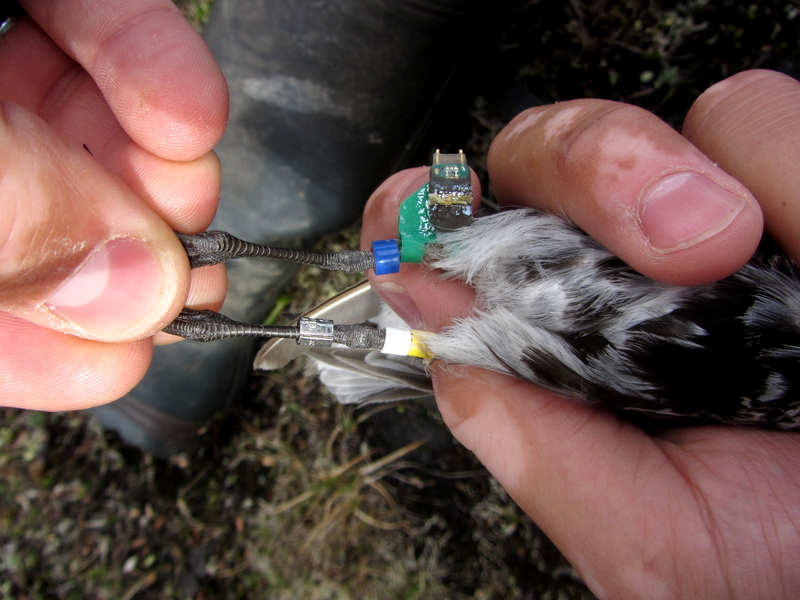 Since 2011 we colour mark Dunlin adults to enable individual recognition in the field and be possible to follow broods and get data on breeding fenology, territory and nest-site fidelity as well as annual survival. The combination we use is an engraved yellow flag with black alphabet combination of three letters on left tibia and a dark-blue plastic c-ring together with a metal ring on right leg, on tibia and tarsus, respectively. In 2016, eight individuals were fitted with geolocators attached to a green flag on the tibia. These individuals have been marked using a combinations of colour rings: always a green flag and blue colour ring on the right tibia, and a combination of two colour rings on the left tibia. The metal ring is on the left tarsus. Dunlin from 2016 with geolocotor on the green flag.